Xavier University, Xavier Institute of Management celebrated its Foundation day today. It marks the successful collaboration embarked upon between the Odisha State Government and The Jesuit Society twelve years ago. Every year eminent speakers are invited to address the students and share their brilliant thoughts. In the past, business connoisseurs like Ms. Vinita Bali, Madhur Bajaj, Lalite Gupte, Ashok Soota and Dr. Preetha Reddy have delivered lectures on the Foundation Day. 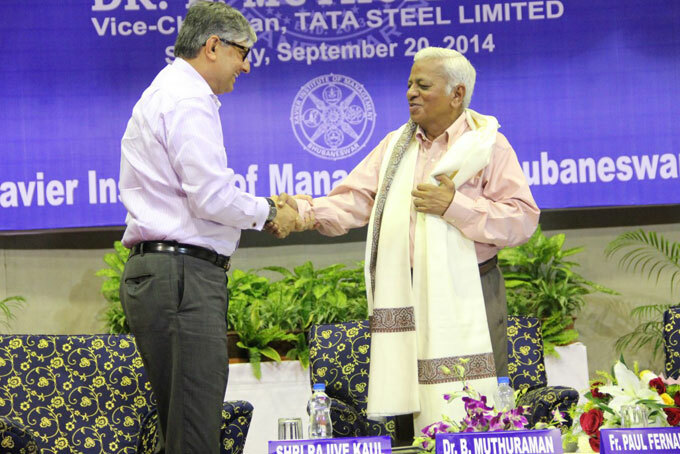 This year XIMB welcomed Dr. B. Muthuraman, the Vice Chairman of Tata Steel, India's largest steel manufacturer and chairman Tata International. The event was presided over by Mr. Rajive Kaul, Chairman, XUB, XIMB and Fr. Paul Fernandes, S.J., Vice Chancellor & Director, XUB, XIMB. Dr. Muthuraman has been awarded the Padma Bhushan by the Indian government in 2012. He studied metallurgical engineering at IIT Madras, followed by M.B.A. from XLRI Jamshedpur, and started his career at Tata Steel in 1966. He is also the former Chairman of the Board of Governors of XLRIand National Institute of Technology, Jamshedpur (N. I. T.). Dr. Muthuraman, was also nominated as the Chairman of the Board of Governors of IIT Kharagpur by former President of India, Mrs. PratibhaPatil. He was also the President of the Confederation of Indian Industry (CII) during the year 2011 – 12. Recently, XLRI, Jamshedpur has conferred him with Lifetime Achievement Award. He has held several key positions in the Tata Steel Group of Companies. Currently, he is the Chairman of Tata International Ltd., Tata Africa Holdings Ltd. and on the Boards of Tata Industries and Strategic Energy Technology Systems Ltd. He is also the member of the Board of the Institute of Dalit Studies, New Delhi. The event was attended by all the students, the faculty and the staff members. 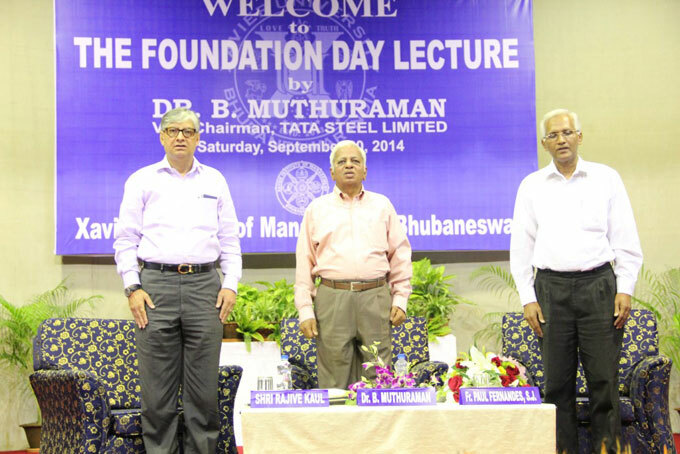 The audience got to learn a lot from Dr. Muthuraman as he shared his thoughts and personal experiences. He addressed the bright, young minds and inspired them to strive to build a glorious future and lead India to progress by being responsible individuals and managers. Dr. Muthuraman emphasized that the growth opportunities in India are galore, but mere presence of these opportunities does not lead to success. There are a lot of challenges that need to be overcome; the biggest of them being, the social challenge. There is a need to bridge the gap of social inequality; and this inequality is not about an outcome but the inequality of opportunities that arise due to gender and caste differences. 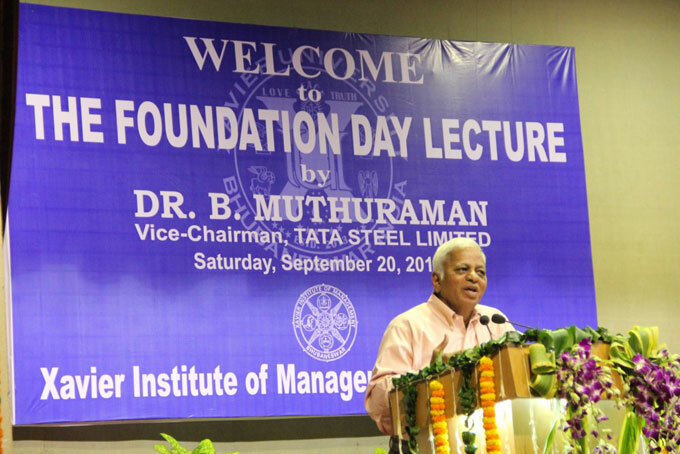 Dr. Muthuraman motivated the budding future managers to take up the responsibility and contribute to the development of the underprivileged and disadvantaged sections of the society. Furthermore he urged the young generation to strive to be a leader who can strike a fine balance of having both visionary dimension and architectural dimension. He focussed on the importance of introspection and reflection which can help one to achieve success in all the spheres of life. The audience had the opportunity to interact with Dr. Muthuraman through a question and answer session where they asked some pertinent questions with respect to CSR drives of the companies and their contributions for the development of the society. It was an enriching session which left a deep impact on the minds of the audiences to become better managers and citizens of the nation. Fr. Paul Fernandes. S.J., Vice Chancellor & Director, XUB – XIMB concluded the evening with a vote of thanks reflecting upon the institute’s 27 year old legacy which has now been granted a University status, an important milestone in the history of an institute committed to developing competent, committed and compassionate leaders who connect business and society. XUB offers its flagship post graduate programmes in the streams of Business Management, Human Resource Management and Rural Management along with doctoral programmes, Executive programmes and Global MBA programme and graduate level programme in Commerce.